Seri Muka (one of the most popular of Malaysian Kuih – bite-sized desserts or cakes) is a steamed dessert in two layers: a bottom layer of glutinous rice cooked in coconut milk; and a thick custard-like top layer flavoured with the juice of pandan leaves (which provides the vibrant green colouring). 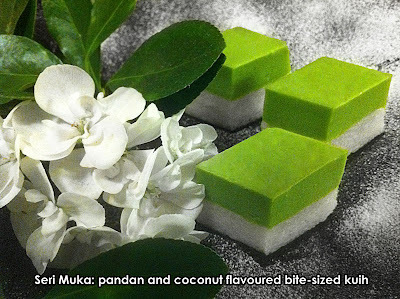 There are many Seri Muka recipes available and while most have a similar approach to the bottom layer, the balance of ingredients in the top layer can vary wildly. Some people use more eggs and very little flour and others prefer fewer eggs, using more flour or tapioca flour to provide the necessary stiffness. We prefer the following recipe which uses a combination of eggs and flours to create a custard with a slight cake-like texture. Pre-soak the glutinous rice in water for about 4 hours and drain it. Mix in the coconut milk and salt and steam for about 30 minutes on a medium heat. Set aside to rest for about 10 minutes then transfer into a 22cm square loose-bottomed cake tin. Press quite firmly into an even layer, making sure it forms a good seal with the tin around the edges. To make the pandan water, chop the pandan leaves into small pieces and mash them up in a blender with the water until you get a good smooth pulp. Strain the pulp through a sieve and squeeze it out to get a beautiful dark green fragrant water. Discard the pulp. Mix the pandan water with all the other ingredients for the top lawyer in a largish bowl (it doesn’t matter in what order you add them – just throw them all in together!). Beat with a hand whisk or electric mixer for a couple of minutes until the mixture is nice and smooth. Strain through a sieve to get rid of any little lumps. Let it rest for a few minutes while you finish off the bottom layer. Once you have pressed the bottom layer into the tin properly, pour the top layer mixture on top of the rice and steam again for 30 to 40 minutes over a medium heat. Remove from heat once the top layer has stiffened throughout and leave to cool before removing from tin and cutting into squares or diamonds. Steaming can be done in a bespoke steamer if you have one big enough to take the cake tin. Otherwise it works quite well by placing a square tin in a large wok with a lid on and water at the bottom below the tin. Make sure it doesn’t boil dry. I follow your recipe, is really easy to mix.